The history of Rohtak dates back to the ancient times. Several stories make round about its name and foundation. One story goes that Rohtak was founded as ‘Rohtasgarh’ during the reign of Raja Rohtas in ancient times, and it is considered to be authentic. It is also claimed that the town derives its name from the Roherra tree called ‘Rohitaka’ in Sanskrit. It is said that before the town came into existence, it was the site of a forest of Rohitaka trees, and hence its name became Rohtak. 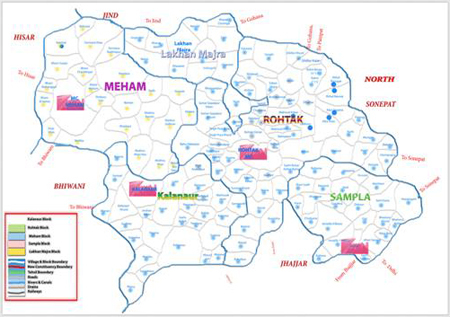 Rohtak is known as political capital of Haryana. A medium sized town, it is strategically located about 75 kms West of Delhi on the Delhi-Ferozepur railway route and Delhi-Hisar-Ganganagar National Highway No. 10. It is well connected by rail and road. There is a 5-minute bus service between Rohtak and Delhi. The town has been flourishing ever since the creation of Haryana state in 1966, and is now known as the education hub of the state. The town has two universities - Maharshi Dayanand University, and Pt. Bhagwat Dayal Sharma Post-Graduate Institute of Health Sciences - and a deemed university, namely, Indian Institute of Management, which, presently, functions from the premises of the Maharshi Dayanand University. The University is located right on the Delhi bypass, with railway station being just 10 minutes drive from the Campus. Several new institutions of national importance are coming up. These include National Institute of Footwear Design, Institute of Hospitality and Catering Technology, State Institute of Fashion Design, State Institute of Film and Television, and State Institute of Fine Arts. Besides, there are 10 colleges of general education, 7 Engineering Colleges, 2 Law Colleges, 7 Management Institutes, 2 Ayurvedic Colleges, 12 Colleges of Education, 2 Polytechnics, 1 ITI , and a host of good public schools in the town. Rohtak town and its surroundings have some monuments of medieval and ancient tomes evocative of its past history. Rewri of this town is known not only in India, but abroad also.